I remember reading “Koko’s kitten” as a child and being absolutely amazed! A gorilla communicating with people! For those who don’t know Koko is a 38 year-old lowland gorilla who learned to speak American Sign Language when she was just a baby. Her teacher, Dr. Penny Patterson, began working with Koko as a Ph.D. project at Stanford. Koko now knows over 1000 signs and understand over 2000 spoken English words. Koko doesn’t just mimic, she understands. Dr. Penny Patterson gives an example in this 1980s early documentary of Koko when she says that after teaching Koko the sign for ring, Koko called it a “finger bracelet”. Koko isn’t one of a kind, she’s just been given the oppurtunity to show us what animals are capable of. Alex the parrot is another great example. He possessed more than 100 vocal labels for different objects, actions, colors and could identify certain objects by their particular material. He could count object sets up to the total number six. Take a look at how Alex answers questions on shape, color and numbers. You’re probably thinking to yourself what does this have to do with parenting. Well, teaching our children about nature is an important part of how they grow up and view the world. It’s really sad when young children only know that zebras, lions and monkeys live in the Zoo! Get your child to learn that there’s more to insects than crushing them 🙂 This can sometimes be especially hard for city dwellers but there’s still a lot you can do to get your child in touch with nature, and not just the one in your backyard. Talk about everything you see, leaves, plants, insects and birds. Take along an insect box or jar and bring back some snails or bugs to get a closer look at. Watch your 3 year old be fascinated as the snail comes out of it’s shell and be prepared to answer a whole lot of questions! Check out pictures of animals before you go. Talk about where they originally came from, their environment or what they eat. Having a pet teaches your child how to care for another creature as well as foster a sense of responsibility. It’s also a great learning experience! If you’re not ready for a cat or a dog, try a chameleon, parrot or hamster. Books are always a great way to introduce your child to new things. Point to the pictures while you read, ask your child what she thinks is happening and why or let her draw her own paintings of the animals. The Hungry Caterpillar, From Head to Toe, Tarra & Bella and Koko’s Kitten are just a few ideas to start out with. Yes, I’m saying watch some T.V. it can be educational. Most of us will never get a chance to go to Africa, the Amazon or Australia to see all these different environments and the animals that live there. This can sometimes be the only way for children to see the animals in their natural habitat. The joy of reading is one of the greatest gifts you can give your child. Letting your imagination go as you read through the words is an amazing feeling. Get your child into reading early on. You can start introducing books at a very early age, as young as 3 month. Here are some tips on how to choose appropriate books for your infant, toddler and preschooler. With a list of some of my favorites for every age. Enjoy! At this age try to choose books that are either cloth or board books. Avoid paper pages, they’re difficult for babies to turn and will tear immediately. Look for books with high contrast colors with simple, clear and big pictures with a character or two in each page. While reading through the book remember to point your finger at the object you’re describing. This way your baby understands what you’re talking about. Books at this age don’t need to have any text, you can improvise each time you read the story making it a new experience every time! Make sure to give your baby the opportunity to look through the book on his own as well and practice turning the pages. Is a soft and colorful cloth book. Your baby can enjoy touching and squeezing the different insects in the book. 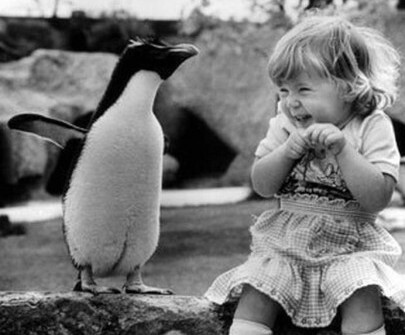 These high contrast black and white images will grab your baby’s attention while you talk to her about the animals. Babies at this age start enjoying more color in books as well as feeling different textures. Again stick to cloth or board books and include books with colorful and simple images. Add more books with textures, tactile experiences add pleasure to your baby’s reading experience and foster sensory exploration. Introduce books that encourage object labeling and everyday life. Brown Bear, Brown Bear, What do you See? (Board Book) by Bill Jr Martin and Eric Carle Your baby will enjoy reading this book into her preschool years. This book has beautiful and clear photographs of different animals. As well as different textures for each of them that your baby can enjoy touching. At around 2 years children start experiencing a language boom when words just start flowing and your toddler starts expressing himself easier. Toddlers can understand everything way before they can express themselves. 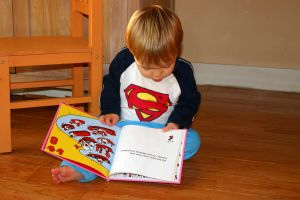 Books that have more detail, a story line and encourage participation are perfect for toddlers. Lift-the-Flap books are great fun for kids and help develop fine motor skills. Encourage your child to lift the flaps and guess what’s under. You’ll soon find your child joining in with load exclamations of “YES” “NOoo” “It’s a LION” as you read along. Look for books that label familiar people and emotions, as well as books full of rhyme and rhythm. Point out objects that you see in your life. Try rhyming funny and made up words. Remember to often point to the text and images as you read. For a great list of books for toddlers Click Here! This classic is full of fun characters and Dr Seuss signature rhymes. New editions are available as Lift-the-Flap books as well. Watch how this caterpillar make it’s way through all sorts of yummy items and transforms into a butterfly. Your child is developing very fast now. Language both expressive and receptive is increasing, your child is picking up more and more words and mimicking your sentences. At this age children also start enjoying dramatic and imaginative play. They are also developing skills like sharing and empathy. Books with imaginative and make belief characters are great for this age. Try to include books that foster creativity and imagination as well as those that represent real life situations your child can relate to. Books with a story-line and carry a message like sharing, kindness, etc can be engaging for children. Include your child in the storytelling experience by asking him what will happen next or to make up his own story. For a great list of books for your preschooler Click Here! A beautiful and imaginative classic. Your child will spend hours enjoying Richard Scarry’s illustrations and discovering new details every time! I hope this gives you some tips on choosing books for your child at different stages. These are just guidelines for choosing books that children will generally be interested in. Remember to consider your child’s interests and developmental abilities when choosing books. What do you think ? What are your child’s favorite books?